CodeIgniter is a powerful, high-performance, open-source PHP framework that helps you author PHP applications rapidly. CodeIgniter is known for having a light footprint, there by reducing your server’s work. CodeIgniter has an exciting online manual, a couple of helpful video tutorials and an active user forum. Zend framework is an extremely powerful framework with a slightly higher learning curve. 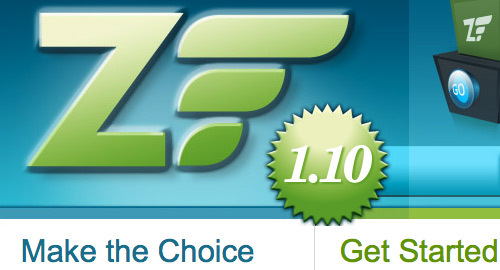 Developed by Zend Technologies, Zend Framework is licensed under the New BSD license. It is along the same lines as CodeIgniter and CakePHP. Extending the art & spirit of PHP, Zend Framework is based on simplicity, object-oriented best practices, corporate friendly licensing, and a rigorously tested agile codebase. Zend Framework is focused on building more secure, reliable, and modern Web 2.0 applications & web services, and consuming widely available APIs from leading vendors like Google, Amazon, Yahoo!. Kohana is a PHP 5 framework that uses the Model View Controller architectural pattern. 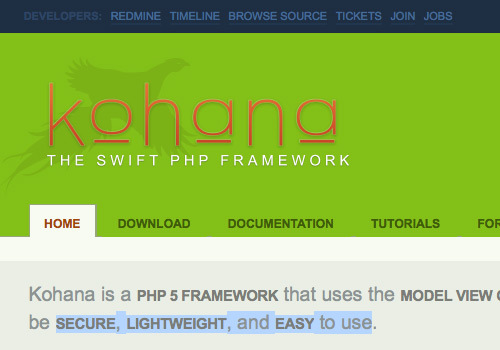 Kohana is a fork of CodeIgniter intended to work only with PHP 5. Kohana is completely community driven. What makes Kohana favored by many developer is it’s super lightweight, it has no dependencies on PECL extensions or PEAR libraries. Large, monolithic libraries are avoided in favor of optimized solutions. It is built by the developers of Liferay, has a lot of ready-to-use components & requires Yahoo! User Interface Library to run. Solar is an Open Source PHP5 framework for web application development. Solar stands for “Simple Object Library and Application Repository” for PHP5. 52framework is a CSS framework which aims to provide an easy way to build websites using HTML5 & CSS3 while still supporting all modern browsers (including ie6). It uses HTML5 tags like header, nav, section, article, footer or new input field types like url, email, etc. The framework also has a HTML5 compatible reset stylesheet.